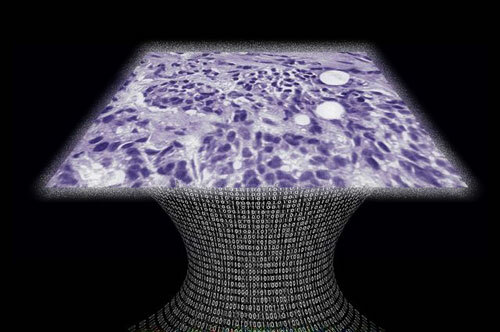 (Nanowerk News) UCLA researchers have developed a lens-free microscope that can be used to detect the presence of cancer or other cell-level abnormalities with the same accuracy as larger and more expensive optical microscopes. The invention could lead to less expensive and more portable technology for performing common examinations of tissue, blood and other biomedical specimens. It may prove especially useful in remote areas and in cases where large numbers of samples need to be examined quickly. The microscope is the latest in a series of computational imaging and diagnostic devices developed in the lab of Aydogan Ozcan, the Chancellor's Professor of Electrical Engineering and Bioengineering at the UCLA Henry Samueli School of Engineering and Applied Science and a Howard Hughes Medical Institute professor. Ozcan's lab has previously developed custom-designed smartphone attachments and apps that enable quick analysis of food samples for allergens, water samples for heavy metals and bacteria, cell counts in blood samples, and the use of Google Glass to process the results of medical diagnostic tests. The latest invention is the first lens-free microscope that can be used for high-throughput 3-D tissue imaging -- an important need in the study of disease. "This is a milestone in the work we've been doing," said Ozcan, who also is the associate director of UCLA's California NanoSystems Institute. "This is the first time tissue samples have been imaged in 3D using a lens-free on-chip microscope." The research is the cover article today in Science Translational Medicine ("Wide-field computational imaging of pathology slides using lens-free on-chip microscopy"), which is published by the American Association for the Advancement of Science. The device works by using a laser or light-emitting-diode to illuminate a tissue or blood sample that has been placed on a slide and inserted into the device. A sensor array on a microchip -- the same type of chip that is used in digital cameras, including cellphone cameras -- captures and records the pattern of shadows created by the sample. The device processes these patterns as a series of holograms, forming 3-D images of the specimen and giving medical personnel a virtual depth-of-field view. An algorithm color codes the reconstructed images, making the contrasts in the samples more apparent than they would be in the holograms and making any abnormalities easier to detect. Ozcan's team tested the device using Pap smears that indicated cervical cancer, tissue specimens containing cancerous breast cells, and blood samples containing sickle cell anemia. In a blind test, a board-certified pathologist analyzed sets of specimen images that had been created by the lens-free technology and by conventional microscopes. The pathologist's diagnoses using the lens-free microscopic images proved accurate 99 percent of the time. Another benefit of the lens-free device is that it produces images that are several hundred times larger in area, or field of view, than those captured by conventional bright-field optical microscopes, which makes it possible to process specimens more quickly. "While mobile health care has expanded rapidly with the growth of consumer electronics -- cellphones in particular -- pathology is still, by and large, constrained to advanced clinical laboratory settings," Ozcan said. "Accompanied by advances in its graphical user interface, this platform could scale up for use in clinical, biomedical, scientific, educational and citizen-science applications, among others."